There are four morphologically similar species in the Holarctic genus Acartophthalmus Czerny, the only genus confidently placed in the family Acartophthalmidae, with Acartophthalmites only tentatively allied. This small grayish family is often found in association with rotting fungi and carrion in damp woodlands (Chandler 1982, McAlpine 1987, Papp & Ozerov 1998), but adults have also been collected on dung, sap (Greve 1988, Máca & Rohácek 1983) and flowers. Acartophthalmus bicolor Oldenberg has been observed ovipositing on a dead snake in Russia, and larvae have been reared from decaying meat (Papp & Ozerov 1998). Males have been observed waiting for females on decaying organic matter, protecting patches of territory from other males; resident males met invaders by flapping wings, with the smaller male usually retreating (Papp & Ozerov 1998). The genus was last treated by Nilsson (2009). infuscation along anterior margin. Holarctic, common. -- Fore coxa entirely black. Wing clear. Russian Far East. legs yellowish. Wings smoke-coloured along anterior margin. Larger species, body length 2.0-2.2 mm. Holarctic. Acartophthalmus is a genus of small (2.0-3.0 mm in length) grayish to ash-brown flies, sometimes with additional yellow or brownish-orange patches on the head, thorax and legs. The genus can be most readily identified by a complete subcostal vein, a costal break that is relatively distant from the humeral cross-vein, an arista that is twice as long as the antenna, micropubescent eyes, long ocellar bristles, and long divergent postvertical bristles that are widely separated at the base. In addition to these characters, there are three well-developed reclinate fronto-orbital bristles with single smaller bristles in between them. There is also one inner vertical bristle, one outer vertical bristle, and one pair of vibrissae that are almost indistinguishable from the relatively large genal bristles, being slightly more incurved. Furthermore, the thorax and abdomen are setulose, there are three dorsocentral bristles, one pair of well-developed lateral scutellar bristles, one pair of apical scutellar bristles, one postpronotal bristle and two notopleural bristles. There are no acrostichal, interfrontal or preapical tibial bristles. All bristles are black. In the male, tergite 6 is absent and the 'annulus' is composed of fused sternites 6 and 8 (Buck, 2006). The cerci are small, rounded, membranous and bare. The epandrium and surstyli are largely fused and setose, and the surstyli are acutely triangular and curved apically. Internally, the male genitalia are made up of a long rod-like phallapodeme (fused to the hypandrium anteriorly), a broad hypandrium (attached to sternite 10) and pregonite (possibly the postgonite), a small ejaculatory apodeme, and a flat basiphallus (forming a ring with the base of the phallapodeme through which the ejaculatory duct passes) that is fused to the distiphallus. The distiphallus is extremely long, spinulose and sac-like, and the hypandrium has a small anterior setose extension that McAlpine (1987) treats as the gonopod. In both sexes, spiracle 7 is absent , and in the female, the spermathecal ducts are rolled into a single tight coil (Buck, 2006). The female abdomen has segments 8-10 extremely thin and elongate when fully extended (otherwise retracted), having extensive membranous spaces in between segments. The cerci are also relatively long and thin. Internally, there are two small, irregular and heavily sclerotized spermathecae, and the spermathecal ducts are extremely elongate and coiled distally (Brake 2000). Immature stages are discussed in detail in Papp & Ozerov (1998). Eggs are 0.5mm in length, white, elongate oval in outline, and covered with fine honeycomb-like reticulations (Papp & Ozerov 1998). Larvae are white, cylindrical and tapering anteriorly. The head segment of the third instar is strongly bilobate apically, the posterior spiracles are raised, truncated, and with small, radially oriented spiracular pits, and the cephalopharyngeal skeleton is well developed. The puparium is light brown with the anterior end strongly flattened. While Acartophthalmus is clearly monophyletic, its relationship to other families within the Acalyptrata has been the subject of much speculation. The first described species (Acartophthalmus nigrinus) was initially placed in the genus Anthophilina (Anthomyzidae), but was subsequently relegated to the Clusiidae in its own monotypic genus Acartophthalmus (Czerny 1903, Melander & Argo 1924). Acartophthalmus has since been associated with the Milichioidea and Drosophilomorpha (Hennig 1939). McAlpine (1989) considered the Acartophthalmidae to be the sister-group to the Clusiidae within the Opomyzoidea, but we agree with Brake (2000), Buck (2006) and Griffiths (1972) in considering it more closely related to the families in McAlpine's (1989) Carnoidea, such as the Chloropidae and Milichiidae (Brake 2000). The sister group to the Acartophthalmidae is currently unknown (Buck, 2006). Ozerov (1987) last revised Acartophthalmus. An extinct fossil fly from the Eocene/Oligocene of the Baltic Region, Acartophthalmites tertiaria Hennig, has been tentatively allied to the Acartophthalmidae. While Acartophthalmites is similar to Acartophthalmus in chaetotaxy and gross morphology, it is much larger (4.0-4.5 mm in length), the eyes are bare, the postverticals are not widely separated, the anterior two fronto-orbitals are closely spaced, there is a dominant dorsal bristle on the pedicel (not ventral), there are no smaller bristles in between the fronto-orbitals, the vibrissa is absent, the genal bristles are very weak, there is one pair of prescutellar acrostichals, a well developed proepisternal bristle, there is no break on the costa (although McAlpine (1989) has found a weak subcostal break in one specimen), and vein R1 is setose distally. Hennig (1965) suggests that a general similarity in morphology places Acartophthalmites, Acartophthalmus, the Clusiidae and the Periscelididae in the same circle of relatives, but this hypothesis is not convincingly supported. Brake, I. 2000. Phylogenetic Systematics of the Milichiidae (Diptera, Schizophora). Ent. Scand. Suppl. 57: 1-120. Buck, M. 2006. A new family and genus of acalyptrate flies from the Neotropical Region, with a phylogenetic analysis of Carnoidea family relationships (Diptera, Schizophora). Systematic Entomology 31: 377-404. Chandler, P.J. 1982. Two fungus associated flies new to Ireland (Diptera: Acartophthalmidae and Platypezidae). Irish Naturalists' Journal 20(11): 479. Greve, L. 1988. Acartophthalmus bicolor Oldenberg, 1910 (Acartophthalmidae, Diptera), a new family and species to the Norwegian fauna. Fauna Norv., Ser. B 35(2): 91. Griffiths, G.C.D. 1972. 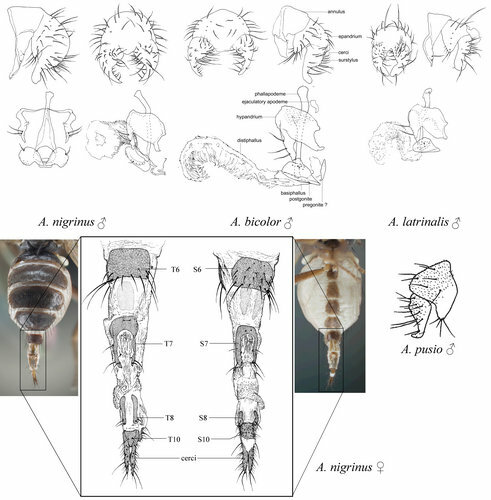 The phylogenetic classification of Diptera Cyclorrhapha with reference to the structure of the male postabdomen. Dr. W. Junk N.V., Publishers, The Hague. Hennig, W. 1939. Beiträge zur Kenntnis des Kopulationsapparates und der Systematik der Acalyptraten. II. Tethinidae, Milichiidae, Anthomyzidae und Opomyzidae. Arbeiten über morphologische und taxonomische Entomologie aus Berlin-Dahlem 6: 81-94. Hennig, W. 1965. Die Acalyptratae des baltischen Bernsteins und ihre Bedeutung für die Erforschung der phylogenetischen Entwicklung dieser Dipteren-Gruppe. Stuttgarter Beiträge zur Naturkunde. 145: 1-215. Máca, J. & J. Rohácek. 1983. Prehled nalezu druhu celedi Acartophthalmidae (Diptera) Ceskoslovensku. Cas. Slez. Muz. Opava (A), 32: 233-237. McAlpine, J.F. 1987. 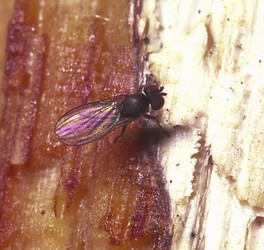 Acartophthalmidae. Pp. 859-861. In J.F. McAlpine et al. (editors). Manual of Nearctic Diptera, Vol. 2. Monograph 28, Research branch, Agriculture Canada, Ottawa. McAlpine, J.F. 1989. Phylogeny and classification of the Muscomorpha In J.F. McAlpine (ed.). Manual of the Nearctic Diptera. Vol. 3. Research Branch, Agriculture Canada. Monograph No. 32. Ottawa. Melander, A.L. & N.G. Argo. 1924. 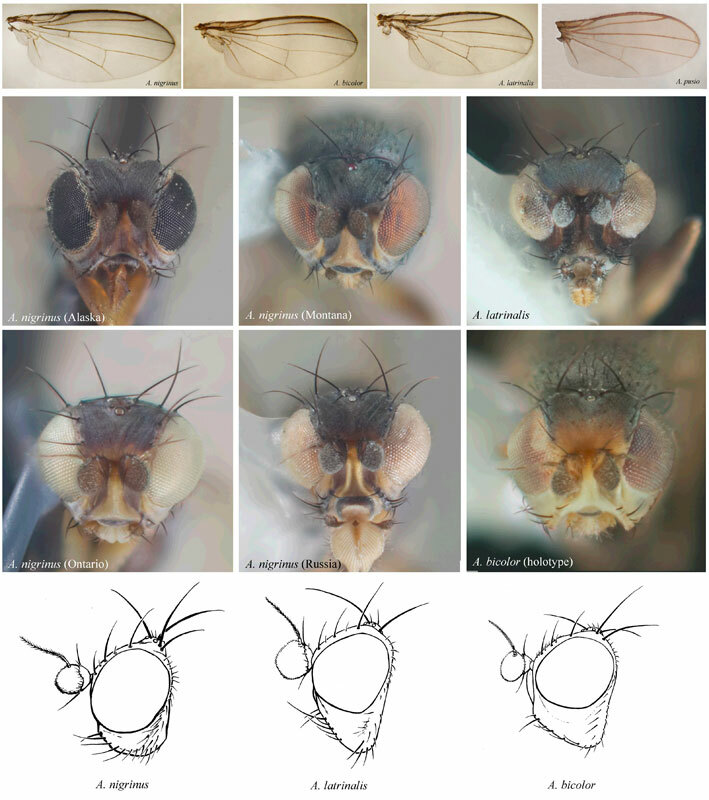 Revision of the two-winged flies of the family Clusiidae. Proceedings of the U.S. National Museum 64:1-54. Nilsson, V.J. 2009. Bidrag till kännedomen om de acalyptrata flugorna. Del 1. Acartophthalmidae och Clusiidae samt några smärre notiser. Årgång 1: 1-7. Papp, L. & A.L. Ozerov. 1998. Family Acartophthalmidae. Pp. 227-232. In. Contributions to a manual of Palaearctic Diptera, Vol. 3. Science Herald, Budapest. Page: Tree of Life Acartophthalmidae. Authored by Owen Lonsdale. The TEXT of this page is licensed under the Creative Commons Attribution-NonCommercial License - Version 3.0. Note that images and other media featured on this page are each governed by their own license, and they may or may not be available for reuse. Click on an image or a media link to access the media data window, which provides the relevant licensing information. For the general terms and conditions of ToL material reuse and redistribution, please see the Tree of Life Copyright Policies.